Traite de Perspective, ou sont contenus les fondemens de la Peinture. Paris:: Anisson, 1701., 1701. 8vo. xxi, , 227,  pp. 63 engraved diagrams (4 full-page), 7 engraved numbered plates (1 folding), engraved title-page vignette and head and tail-pieces; plates 5 & 8 supplied in photocopy facsimile, first free front end-paper mostly missing. Original full calf, 5 raised bands; worn, rear hinge cracked, front cover detached. Theological Institute of Connecticut blind-stamps to first and last few pages. Spinal library labels. Fair, internally very good. FIRST EDITION OF LAMY'S EXTENSIVELY ILLUSTRATED WORK ON PERSPECTIVE. 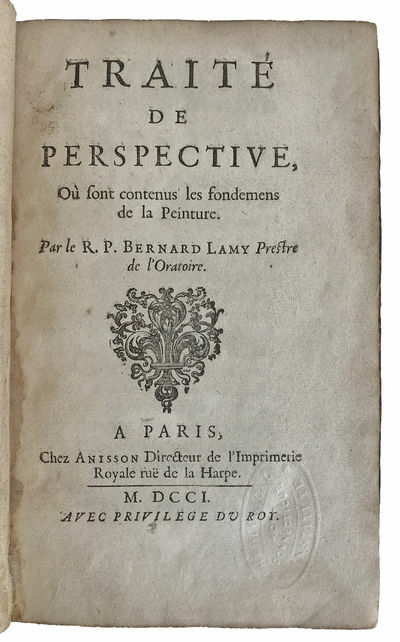 Lamy's "studies resulted in a charming volume that illustrates the. . .eighteenth-century attitude among the French authors of avoiding excessive abstraction in presenting the theory of perspective. Perhaps inspired by Leonardo da Vinci . . . Lamy distinguished between perspective aerienne (aerial) and perspective lineale (linear), which was not very common in his day. He mainly concerned himself with linear perspective. "In his practice of perspective Lamy concentrated upon the construction of the image of a grid of squares by means of a distance point method. He then used the perspective grid for various procedures, such as determining the perspective image of a plane configuration. . ., constructing images on a vault. . ., and creating an anamorphosis" (Andersen, p. 472).